New release of Photopea is out! It has 32 156 lines of code. Play with it at the main site. Brand new font parser Typr.js! 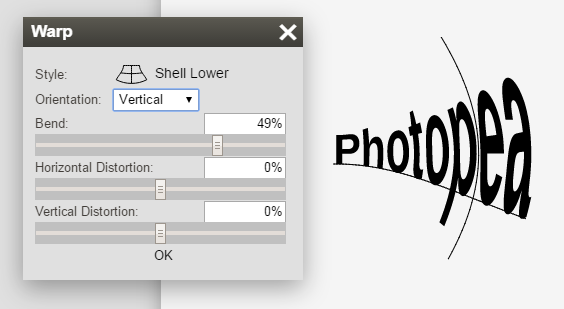 Photopea was using opentype.js library for parsing and drawing fonts. Because of bugs, OTF fonts were rendered incorrectly. Several free TTF fonts were impossible to parse and had to be excluded from our database. We made a brand new library Typr.js, which renders OTF fonts correctly and supports even old TTF files. We released it as open-source, available to everybody for free. Type layers in a PSD file may have warp parameters attached to them. Warping parameters bend the text in some way. Starting with this release, warped layers are rendered correctly. You can also change warping parameters of existing layers and add warping to the new layers.